Below, video shows Marauder gun kit w/R.A.I. Stock Adapter (RAI A005) & (RAI A010)) plus (double-pocket soft pistol case). The .25 cal delivers 37 FPE. If you choose the .357 caliber Rex, you'll enjoy a stunning 95 FPE. Significant power for a PCP pistol! Fill pressure 220 BAR (approx. 3,190 psi). .357 = 5 shots per fill. Turn your pistol into a rifle with this fully adjustable stock with adapter to lower, heighten, or shift left or right. There are five options to choose from, and a folding stock adapter. 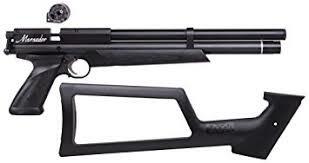 RAI A009 Adjustable stock only, 6 Position Mil Spec Collapsible Stock and Buffer Tube. RAI A010 Side Folding stock Adapter only. 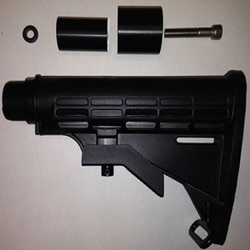 All adapters are made to be used with actual AR stocks either mil-spec or commercial threads will work with the adapter, DO NOT try to use airsoft or paintball stocks. Designed with the silhouette and field target shooter in mind. Turn your pistol into a rifle with this fixed stock adaptor. Turn your pistol into a rifle with this fully adjustable stock with adaptor to lower, heighten, or shift left or right. A quick review of this product from Mr HollowPoint himself! Make sure you get past the part with all the power tools... you will see they aren't really needed.